I hate buying clothes online. Not only do I have to worry about sizing discrepancies and color misrepresentation, but I also have to worry about stuff not showing up. I have major indecisiveness, so when I finally decide to order something it is a big deal. The bathing suit above is the latest offender. I finally decided to order it after months of deliberation. I place the order before I go on a trip and by the time I get back home my order is cancelled. I went back into my email and found the stupid notice that I had missed. It said that they were out of green and did I want the blue. Hell no, I did not want the blue. I did not spend months picking out a bathing suit to have the color changed. And now I am back in the depths of indecisiveness, so no new bathing suit for me. 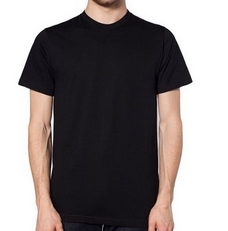 I found a pretty good deal on an American Apparel shirt. I can never justify spending the full amount for their plain t-shirts. But any deal is too good to be true, I guess. This time the seller also tried to get me for a replacement. I don't get it. If the item is not in stock, then update your page. They even said since I was a girl I should want the smaller size anyway. It makes me so angry! This was the dress that I finally decided to wear to that wedding forever ago. The post office messed up this one, not the seller, but it seriously sucked. I had looked at literally thousands of dresses and this one was one of the only ones I thought would work. I gave it two months to come from China. I kept hoping the post office would shape up. It never did and that left me scrambling for a dress last minute...I should've known because dressing for events never goes very well for me. The sad part is, I still want to wear this dress some days. I go into my closet and look around for a girly floral dress and there isn't one. This just happened to me with this J Crew Factory shirt https://goo.gl/5hINFZ. So irraz!! !